The young Czech Jakub Hrůša (b 1981) has succeeded Jonathan Nott as chief conductor of the Bamberger Symphoniker with effect from the 2016/17 season. This, I think, is their first project though it’s not Hrůša’s first recording of Smetana’s cycle of symphonic poems: he set them down for Supraphon with his previous orchestra, the Prague Philharmonia, of which he was music director from 2009 to 2015. I’ve not heard that 2010 live recording but my colleague Brian Reinhart was complimentary about it (review). It’s not entirely clear but I think this SACD may come from live performances. Part of the documentation consists of a conversation about Má Vlast between Wolfgang Sandner and Jakub Hrůša. In this the conductor says that normally he insists on performing Smetana’s cycle complete but that he made an exception in Bamberg when he “matched it” with an unspecified contemporary composition which was a “reflection” on Má Vlast. That may account for the different recording dates: the first three symphonic poems were set down in September 2015 and the rest of the cycle followed six months later. If an audience was in attendance for these performances there is no audible sign of their presence. In the same conversation Wolfgang Sandner says that he knows of no recording of the work which has such broad tempi; Hrůša does not disagree. This may well be the case but whilst the conductor is not afraid to give the lyrical passages their full value I didn’t feel at any time that the music was being treated too expansively. For what it is worth, Hrůša’s 2010 recording plays for 78:53. The point that particularly struck me in the booklet dialogue was that Hrůša points out that he has known Má Vlast “intimately since childhood, and lived with it.” I didn’t read that comment until after I’d listened to the performance for the first time but, having read it, it makes complete sense because this performance feels ‘right’ and ‘lived in’. 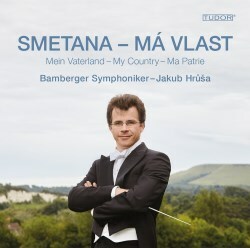 Má Vlast has its weaker pages – I find Tábor and Blaník a bit bombastic at times, for example – but Hrůša’s reading is full of conviction and he carries the listener – or at least this listener – with him over the weaker stretches and makes one appreciate to the full - indeed relish – the high points. Vyšehrad makes an immediate, strong impression. At the start the harp sounds absolutely superb in this recording and when the brass and woodwind sections join in the instruments are beautifully balanced. Hrůša invests the start and finish of this poem with genuine nobility and in between there’s plenty of fervour in the more energetic episodes. The quiet clarinet passage towards the end is full of poetry and atmosphere. This is a distinguished start to the cycle, one which inspires confidence in what is to follow. The delicacy of the flutes and harp at the start of Vltava is absolutely delightful. When the famous big tune arrives I didn’t feel that it surges with quite the same ardour that one hears in Talich’s live 1939 Czech Philharmonic reading (Supraphon SU 4065-2) – though Hrůša is pretty impressive in his own right. In any event, the Talich is rather special: it was recorded in June 1939 when Czechoslovakia was being menaced by the Nazis and patriotic feelings were at fever pitch. This Hrůša performance couldn’t hope to recreate such an occasion or atmosphere: the Talich is an historic one-off and one can readily forgive the limitations of the recording itself. I enjoyed this new performance of Vltava greatly, not least the episode beginning at 5:58 where the long-breathed tranquil violin melody is voiced with great tenderness. Later the power of the waters at the St Johannis rapids is strongly projected. Šárka also comes off very well; the opening is vivid and dramatic. As the piece unfolds the elements of drama and poetry are put across with equal success and I especially relished the exciting, driving conclusion. Hrůša and his players, aided and abetted by the engineers, convey a super sense of space at the start of Z českých luhů a hájů (From Bohemia’s woods and fields). In these opening pages there’s a wonderful amplitude to the orchestral sound which wells up richly from the bass end of the orchestra. This was one of the points at which I made a comparison with Rafael Kubelik’s live 1990 recording with the Czech Philharmonic even though it is, as Peter J Lawson said, “literally incomparable” (review). Kubelik is equally excellent at this point but his recording, though digital, is nowhere near as rich as the Tudor sound. A little later on the Bamberg woodwind section provides a feast for the ears. Hrůša leads a performance that is warm and affectionate and which also, at times, is full of ebullience and vitality. The results are absolutely winning, not least because the Bamberger Symphoniker plays so marvellously. Hrůša’s account of Tábor is not short of mystery and tension at the start though I hear even more suppressed tension in the Kubelik performance. The timpani solos are very potent in the Bamberg performance – possibly a fraction too potent? The fast music later in the piece is delivered with great animation by Hrůša and he conveys excitingly the increasing fervour associated with the Hussite hymn. In Blanik a highlight for me is the episode beginning around 3:00 where the mellifluous Bamberg wind and horn soloists produce playing that is truly ravishing. In the last few minutes of this piece the patriotic joy comes through strongly and when the Vyšehrad theme comes back in splendour just before the close it sounds like a moment of homecoming. The Talich and Kubelik recordings each document a very significant occasion – in Kubelik’s case his return to his homeland after more than forty years of exile – and I’ve always found both of them to be very special and moving performances. Jakub Hrůša’s performance can be judged without any such extraneous associations and for my money it’s a really fine achievement. Hrůša has the music in his blood, cares for it deeply and communicates it strongly. I was completely convinced. The Bamberger Symphoniker plays superbly for him – every department offers distinguished playing. Reviewing Hrůša’s 2010 recording Brian Reinhart noted a certain lack of firepower from the Prague Philharmonia, which is essentially a chamber orchestra. There’s no lack of firepower in Bamberg nor is there any want of finesse. We can enjoy the Bamberger’s playing all the more because the Tudor recording, made in association with BR Klassik, is absolutely first rate. There’s an abundance of detail to be heard but, equally, we hear the ‘big picture’ thrillingly. On this evidence the partnership between Jakub Hrůša and the Bamberger Symphoniker will be a force to be reckoned with.